Why Being Right Is Wrong. 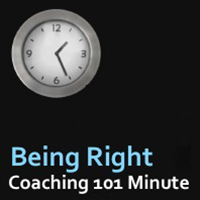 As with all of our Coaching 101 classes, we had a great discussion, but the highlight of this week’s calls were around the topic of being right. And I think this is a really great conversation for all new coaches and even a good refresher for coaches that had been in the industry for a while. It’s really about letting go of the agenda this is what I think the whole conversation comes down to. When we come into coaching, the client is the one who determines the content while the coach determines the process, the coach is there to support the client. And unlike other fields such as consulting or training, coaches must assume the client is the source of all the knowledge. They’re required to answer the challenge of their own lives. And the coach does not set the agenda and we do not give unsolicited advice. So I think a lot of times when brand new coaches are coming to the industry, we feel we have to prove ourselves or we have to be right for the sake of being the coach. And I want to invite everyone listening to this now to know that you need to release yourself from that. Release yourself from the feeling that you must be right or that you must have the answer. Now, as a coach, you’re listening to help the client, to support them in coming up with their own solutions. And I know this sounds really easy in theory, but it’s actually quite a difficult thing to master. It is hard work listening attentively to another human and acknowledging their story. And it’s much easier to tell your story, to provide information and to share solutions or anecdotes or give advice. But we’re not here to do that. We’re here just to help our client to understand themselves more. 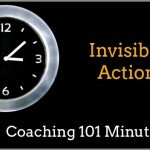 To allow a client the space to set the agenda requires a very specific set of skills that are rather unique to the coaching industry. One of these being able to accept feedback. Now, I know we talked all the time about giving feedback to our clients, but we must also be open and willing to accept feedback from the client about how effectively you are coaching them rather than becoming defensive about it. You really need to look at it as a positive and to take it on as some great feedback to learn from. Each client, I really look at as being a chance for myself to learn how to be a better coach. This is a big part of the coaching relationship. The coaching contract that we have with our clients is to ask for feedback. Every single session, have a chance for some feedback, some open conversation and welcome your client to share with you what’s working, what isn’t working. And once again, it’s not about you even, it’s about the client being a satisfied client if you will, a satisfied customer if you will, customer service. Now, another skill or another thing to really think about and understand is that your own view of the world might be different than your client’s view of the world. So there will be differences there. And to do this, the coach needs to consistently be looking for the good in all of your clients and finding points of engagement. Another important skill is to understand and manage your own emotions so that the client can be free and truly own the coaching session without coming up against any negativity or judgments on your behalf. So it’s really becoming an open vessel, you’re there to support that client purely. Now, one way for me as a coach, and I’ve been coaching now since 2007, is that I always have my own coach. Someone that’s there to be a sounding board for me. So when I’m working with a client, I know that I’m not bringing my baggage or my agenda to the coaching situation. So let go of the agenda. Do not try to be right because the client is right. Here are some of the other questions that were talking about in Coaching 101 this week. What is the connection that ICA has with ICF? Are you credentialed or are you accredited? How do I determine my speciality as a coach? How do I determine a coaching niche? If I chose to be a certain type of coach, can I change my niche down the road or is it something that I would need to go back to school for?